The holiday season is the best time of year to take an unforgettable getaway! If you’re looking for the perfect place to spend some quality time with your friends or family this winter, you should have your Christmas in Yosemite. This destination is not only filled with stunning, snowy scenery, but it also offers some incredible things to do to celebrate this festive time of year. Take a look at some of the finest activities to enjoy during your Christmas in Yosemite and start creating your travel plans to California today! There is a myriad of places to go around Yosemite to find the perfect gifts for all your friends and family members. Whether you’re looking for clothing, outdoor gear and accessories, or simply a unique souvenir of the area, you’ll find the ideal place for your Christmas shopping. Take a look at the entire list of shops in and around Yosemite to plan your shopping excursion during your Christmas in Yosemite. The “”Christmas in Groveland“” event is a wonderful option for finding local Christmas gifts as well. Held the Saturday after Thanksgiving in downtown Groveland, CA, this enjoyable shopping bazaar runs from 4:00 p.m. to 8:00 p.m. and features caroling, sweet treats, and other beloved holiday festivities! Get in the holiday spirit by immersing yourself in the festive local events happening throughout the area. A favorite event of locals and visitors alike is the Polar Express Train Ride in Jamestown, CA. Held every year during the Christmas season, this scenic train ride hosted by the Railtown 1897 State Historic Park features hot cocoa, tasty snacks, and beautiful views of the snow-covered California terrain. Another wonderful way to celebrate the Christmas season is to attend some professional theater performances! The Sierra Repertory Theater will be performing the beloved show, “A Christmas Story,” for the community to enjoy. Bundle up and hit the slopes while you’re spending your Christmas in Yosemite! There are an abundance of winter activities to try around Yosemite. Skiing, snowboarding, snow tubing, and dog sledding are just a preview of what you can do here. Sleigh rides are another option that make the perfect activity for a date night with your special someone. Yosemite Trails Saddle & Sleigh Company provides fantastic rides complete with hot apple cider. 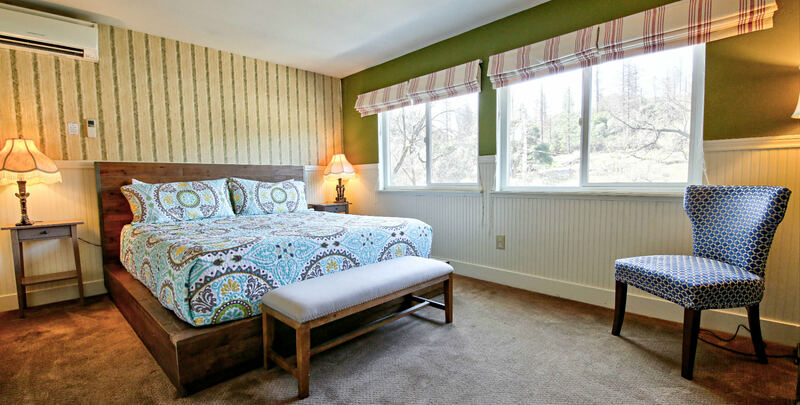 Complete your Christmas getaway to Yosemite by staying in the most comfortable and warm accommodations! Hotel Charlotte is a historic bed and breakfast in Groveland, California, that offers luxurious lodging, creating the perfect setting for a holiday escape. Choose from staying in one of our twelve lovely rooms or renting one of our cozy apartment rentals. You can explore the many attractions of our surrounding town of Groveland, adventure through the magnificent Yosemite National Park, or simply spend time in our peaceful environment; we have a beautiful living room, friendly and helpful staff, and even our very own restaurant to accommodate all of your needs! Don’t wait another minute to start planning your dream vacation; check our availability and book your stay today! To learn more about the many things to do in Yosemite, like more activities to enjoy during your Christmas in Yosemite, download our free Vacation Guide!